The Robertshaw Model 566 Vibration Monitor is a solid state instrument that encompasses a variety of functions all in one unit. The Model 566 can provide 4-20ma output, alarm setpoints, measure acceleration or velocity and has explosion proof enclosure. Vibration can be monitored in either velocity or acceleration. The standard ranges are 0 to 1.5 inches/second or 0 to 3 inches/second when sensing velocity and 0 to 5 g's or 0 to 10 g's when sensing acceleration. A 4-20 mA DC output is provided to drive a 750 ohm maximum load. The Model 566 includes two solid state Triacs (2 amp @ 120/240 VAC) which can be operated in a N.O. or N.C. configuration. Alarms are capable of being latched or non latched (ON-OFF). Alarm # 1 has a monitor time delay adjustable from 0.5 to 15 seconds. LED setpoint indicators are provided to indicate the alarm condition. The Model 566 vibration instrument and optional remote mounted sensor are housed in a weatherproof and explosion proof enclosure. NOTE that on the remote sensor unit the connection from the Model 566 to the remote sensor need only be an ungrounded pair of twisted wire. Velocity or acceleration field selectable without loss of accuracy. Monitor delay on alarm #1. NEMA 4 & explosion-proof enclosure. Velocity range 0-1.5, 0-3 inches/second. Acceleration range 0-5 G, 0-10 G.
Standard enclosure NEMA 4 explosion-proof. Triac selectable for NO or NC operation, latched or unlatched. 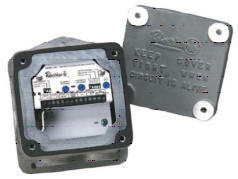 Enclosure has two 3/4" NPT entrance connections. Can be mounted up to 1000 feet (300 m) from Model 566 using ungrounded twisted pair wires (not supplied). E - Enclosure exterior painted with gray epoxy enamel for added corrosion protection.